COTA NT has a 12-seater minibus which is used transport seniors to events and activities in Darwin and the surrounding region. Volunteer drivers are required for our bus rosters. We are recruiting for a new volunteer driver to help support our Multicultural Aged Sponsorship Program (MASP) by driving our (new) 12 seater minibus. 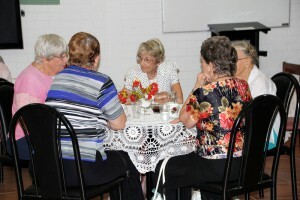 The role requires a driver to pick up a group of seniors in the local Darwin city area (who would otherwise be unable to get out of their homes) and take them home after outings and events such as social coffee and games mornings, visits to the museum, fish feeding, movie mornings, excursions to the Wharf and prayer sessions. Offering seniors connections to their peer groups, language and community helps prevent feelings of isolation and neglect. It’s a very important role to the organisation and we highly value our volunteers who undertake it. Is this you? Or someone you know? All volunteers must be holders of a current OCHRE card. COTA NT is happy to assist volunteers with their application forms. Applications can be made in person at SAFE NT, by post or online. Contact Cecilia Chiolero, General Manager, PICAC and Multicultural Programs Manager on 8941 1004 (Monday to Friday, 9am to 3pm) or email.